It is quite common for cats and dogs to eat grass. Eating grass in and of itself is not a sign of anything as many pets like the taste and enjoy a little vegetation. Both healthy pets and sick pets will eat grass. It is the behaviors that accompany the grass eating (symptoms of acid stomach) that can be a sign of an acid stomach and digestive problems. Some grazing on grass is natural but when pets are specifically looking for it as if they really need it, this can be a sign of acid stomach (acid reflux in dogs) or poor digestion. Many times pets reach for the grass as a way to make themselves vomit too. If you notice your pet is eating a lot of grass, then it's important to watch for other signs of digestive discomfort. If you notice your pet is having rumbling noises after eating, loose stool, gas, vomiting, bad breath or other signs of digestive discomfort, it is important to bring this to the attention of your veterinarian. Getting basic laboratory tests (e.g. blood panel and urine analysis) will provide valuable information, as acid stomach can be a symptom of a more serious health condition such as kidney or liver disease or inflammatory bowel disease (IBD). 1) Consult your veterinarian and inquire about laboratory tests such as a blood and urine test for your pet. Sometimes dog acid reflux symptoms can be a sign of a pet health problem such as kidney disease. Laboratory testing and a veterinary exam are an important first-step. 2) Change your pet’s diet to a hypoallergenic, grain-free diet. Do not use foods that contain chemicals, byproducts or additives that are hard to digest. Avoid key allergens that contribute to inflammation, indigestion and food allergies. 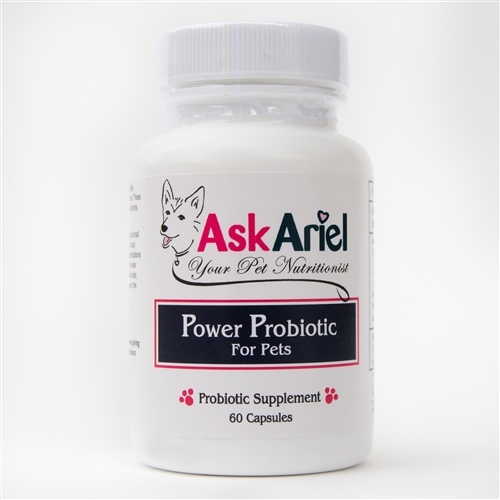 On the Ask Ariel order form at checkout, if your provide your pet's diet, our Nutritionist will include FREE diet tips on the packing slip with your order! 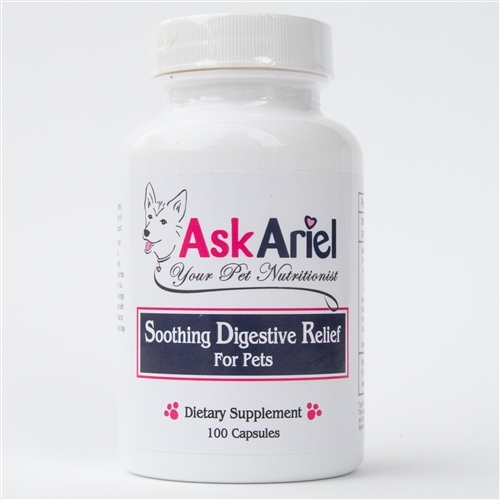 3) Use natural, veterinary-approved supplements for dog heartburn treatment to give your pet fast relief from acid stomach. Once your pet’s stomach feels more comfortable, incidences of grass eating should be greatly reduced. Contact us if you have any questions about cat acid reflux treatment or canine acid reflux treatments.